Community is the core of Renta. 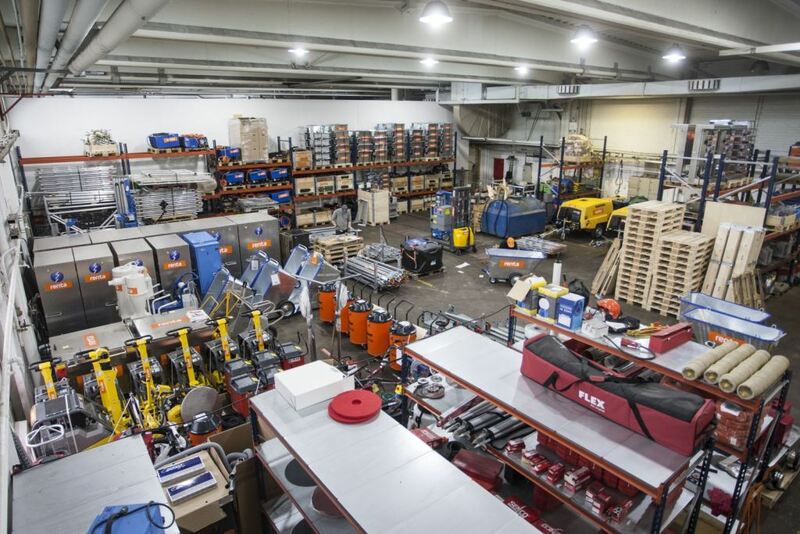 The equipment and machinery leasing business in Finland is going through a revolution, and Renta is leading the way.In less than two years, the company has expanded all around the country – we’re a network of more than 20 branches and growing.Equipment and machinery leasing is a field with traditions, but its mode of operation is being renewed thanks to the opportunities created by digitalisation.Operating since 2016, Renta has quickly grown into a significant player, whose objective according to CEO Kari Aulasmaa is to become the industry leader in the Baltics. “We’ve grown fast, even faster than we planned in the beginning.It has been possible thanks to a favorable market and skilled personnel”, he saysIntera Partners has been a capital provider and major owner since the beginning.In addition, more than 60 of Renta’s key personnel are the owners of their employer.At the moment, Renta employs more than 160 persons, the fourth of which have entered the company through recent acquisitions.At first, Renta acquired the leading scaffolding and weather protection leasing company in the metropolitan area, Telinekymppi Oy. It then bought construction machinery leasing company Kehä-Kone Oy and on-site unit leasing company Jasoca Oy’s equipment and business.In all of these acquisitions, the owners and key personnel of the bought companies moved over to work at Renta as its owners.This model of transaction caters to the spirit of entrepreneurship inside Renta.The ultimate benefit is for the customers, who receive flexible, tailored services. “Business blooms in an environment where people enjoy working together”, Aulasmaa says. Renta has significantly invested in leasable equipment since the beginning. Equipment and machinery leasing with confidence and customer-oriented service requires sufficient investments.This is what Renta has done; it offers an extensive array of construction site products from man lifts to excavators, from aluminium and steel scaffolding to weather protection, and from on-site units to traffic and safety equipment – not to mention a comprehensive selection of construction machinery.For example, Renta carries about one thousand man lifts, as well as on-site units and steel containers. All this is available to our customers all around Finland. 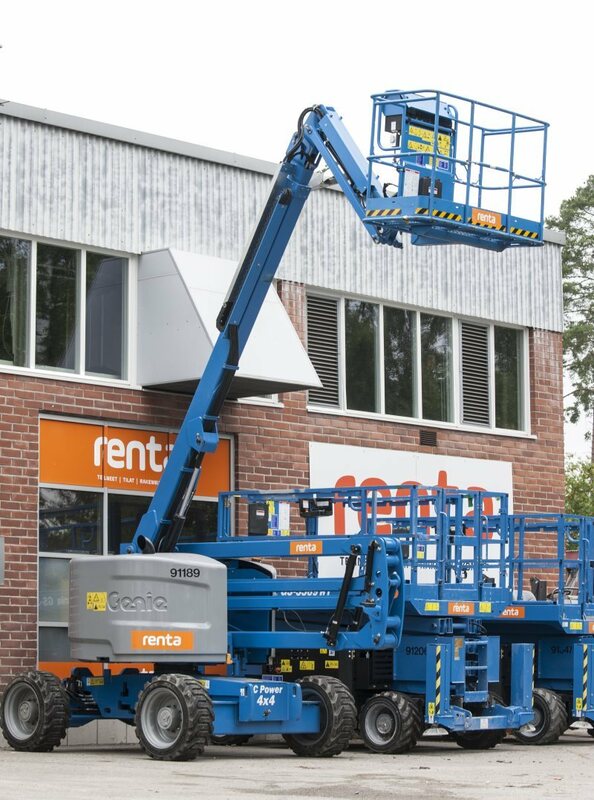 Thanks to Renta Easy, an order can be done smoothly, optimising the leasing time, the number of units included for each piece of ordered equipment and its use. Traditional leasing models are naturally still in good use, but we’ve also created a new channel using the latest technology. The development of traditional models and services with digitalisation has been key all along. “Local service and management are also key. It’s part of the culture of trust that we have been determinedly building in our organization since the very beginning”, says Kari Aulasmaa. Encouraging company culture and expertise have paid off: in less than two years, net sales have grown to over 40 million euro, and continue growing profitably. This has happened because practically significant builders are already Renta’s regular customers. Some of the construction companies, including the SSR Group, which has quickly grown into a nation-wide operator, have already outsourced all of their equipment leasing needs to Renta. “Obviously our timing has proved positive; the construction business is strong at the moment. 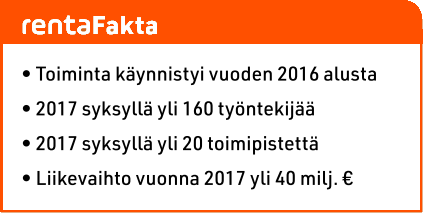 Looking at the forecasts, growth is set to continue next year, and so is our growth – faster than average in the construction business”, Aulasmaa estimates.